Phase shifting is one of the most widely used shape measurement techniques. Because of its precision and low cost, it finds several applications, such as surgery, factory automation and digitization of cultural heritage. 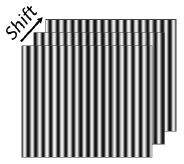 Conventional phase shifting techniques face two serious limitations. First, existing techniques assume that scene points are only directly illuminated by the light source. As a result, they recover erroneous shapes for scenes that have global illumination (e.g., interreflections and subsurface scattering). Furthermore, it is assumed that light sources have infinite depth of field. In practice, all sources have a limited depth of field, resulting in defocus. 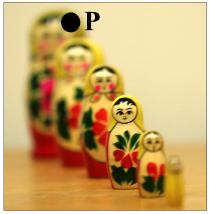 In order to account for defocus, existing techniques need to capture a large number of input images. We present a shape recovery technique called Micro Phase Shifting which overcomes these problems. The key idea is to project sinusoidal patterns with spatial frequencies limited to a narrow, high-frequency band (conventional phase shifting has patterns in a broad frequency band). The bandwidth and the periods are chosen to be small enough so that for each scene point, both global illumination and defocus effects remain constant over all the input images. This enables high quality reconstructions of scenes which have traditionally been considered hard, using only a small number of images. Micro PS differs from existing techniques in only the projected patterns. As a result, it can be readily integrated with existing structured light systems. 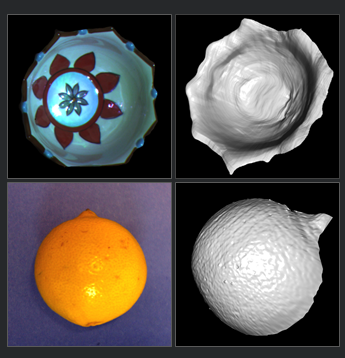 We present 3D scanning results for a variety of scenes with interreflections, subsurface scattering and defocus. The key idea of Micro Phase Shifting is to project sinusoidal patterns with frequencies limited to a narrow, high-frequency band. These patterns produce a set of images over which global illumination and defocus effects remain constant for each point in the scene. In contrast, conventional phase shifting involves projecting patterns belonging to a broad frequency band. 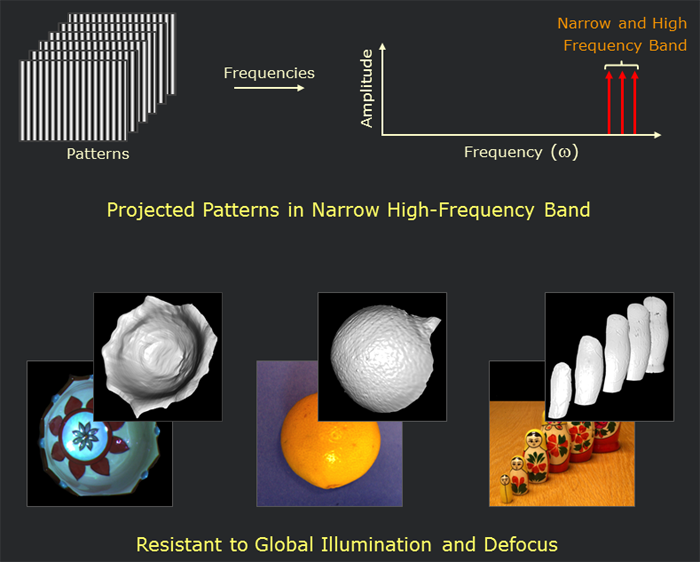 In conventional PS, global illumination might result in a large phase error for low-frequency sinusoids. Micro PS is resistant to such errors since all the frequencies are high. This is illustrated using a V-groove. 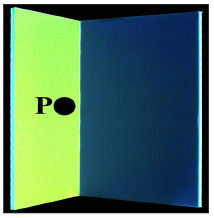 Point P receives global illumination due to interreflections. Here, point P receives defocused illumination due to the large depth of the scene. The plots show the temporal intensity profiles at P as the projected patterns are shifted. For conventional PS, the profiles have different amplitudes for different frequencies, resulting in more unknowns. This increases the number of input images. For Micro PS, since all the frequencies are in a narrow band, all the amplitudes are similar. 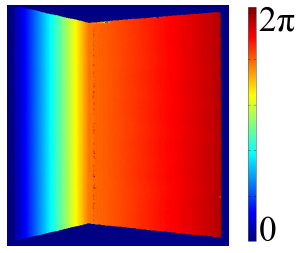 We derive theoretical lower bounds on the number of input images needed for phase shifting and show that Micro PS achieves the bound. In Micro Phase Shifting, since all the frequencies belong to a narrow high-frequency band, all the phase maps have ambiguities. A single unambiguous phase map is computed using the Gushov-Solodkin algorithm . Here, this is illustrated using a V-groove. The techniques and software presented on this webpage can be used freely for non-commercial research and educational purposes. For commercial usage and licensing information, please contact Columbia Technology Ventures (E-mail: techtransfer@columbia.edu; Web site: http://techventures.columbia.edu/).